Is Eating Local Possible In LA?? I decided to leave the Locavores Eating Challenge behind when I popped down to LA at the weekend for the Birthday of my ex-roomate who moved South a few months ago for work. I was, afterall, quite sure that during my quick visit, I would find nothing relevant to the challenge to write about. 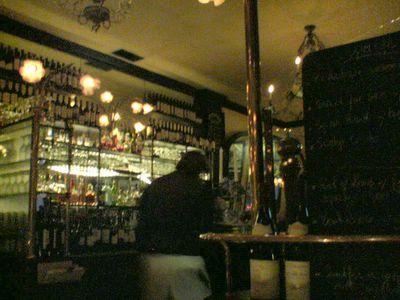 Dinner for 10 people had aready been booked for Saturday evening at a French Bistrot called Figaro. This seemed like encouraging news, given that I have been trying to find more about where my food comes from. I read on, then swiftly balked when I saw the prices. Figaro is a little neighbourhood Bistrot, but the prices were far more grand the restaurant's style suggested, maxing out at a whopping $42 for the filet mignon. Coming from San Francisco, where not even the fanciest places charge these kinds of prices, to say I was surprised was an understatement. According to a review on Citysearch, Figaro recently raised their prices as much as 30-40%! I pondered the menu further and noticed asparagus featured on both the menu and the specials board. Since this month I seem to have become a right pain in the arse when dining out, I snagged our waiter and asked him if he would mind answering a question about the menu. "Given your statement about using BioDynmaic pruduce", I said, "how do you account for the asparagus since it is no longer in season?" He was lost for words, but he assured me he would find out and rushed off to ask someone else. When he returned, he had the news that they do support local farmers and seasonal produce before darting off to avoid the details I had asked for specifically. Food sources aside, the meal was a lot of fun, not least because of the genial company and the friendly service. I couldn't resist trying the Cuisses de Grenouilles - in a lemon garlic sauce, it had been 25 years since I'd last eaten frogs legs. It's true what they say - they are just like chicken, with a slight hint of fishiness. They were a little bit chewy but the sauce improved their appeal and I managed to persuade a few brave people around the table to take their first bite of this French delicacy. Meanwhile, Fred and our LA-based French friend were tucking in to Foie Gras aux Torchon appetizers at $22 each. They let me try a morsel and to my less well trained English palate I thought it was a very good version. Les Francaises were a little less enthusiastic, mildly grumbling that, although enjoyable, it wasn't as good as what you can get in France. Well, nothing ever is, is it..?! When my Entrecote Frites ($38) arrived, I was having trouble cutting into it. It was so dark in the restaurant, I couldn't see if my medium-rare request had been correctly adhered to. It didn't feel or taste like it. At other end of the table, an order of 'well-done' was having the opposite problem so we swapped dishes. In fact, they were both cooked exactly the same, somewhere around medium. The waiter rushed to sort out the mistake and delivered us properly-cooked replacements as soon as he could. Maybe the waiter was the kind of guy who liked being challenged. Ever since I asked him the tough asparagus question, he was super-nice to me, causing a Figaro regular in our party to remark, "What's up with the waiter tonight? Usually he is miserable as anything, but tonight he is being kind of cool". His 'cool-waiter' status was further endorsed when he bought me a free glass of wine as an apology for the steak mishap. (Please don't tell Mr 'well-done' - I don't think he received the same special treatment). The meal was leisurely, slow and enjoyable. The food was solid and quite good, but there was nothing spectacular, as you would expect at those inflated prices. The waiter is going to get just one more positive mention since he bought me a complimentary almond tuille from the in-house organic bakery, to nibble on whilst everyone else finished up with coffee. I don't know what it was with him. Maybe he erroneously mistook me for S. Irene Virbila or Delicious Life's Sarah? PS Hollywood may be a good ten minute drive away, but that isn't to say Figaro doesn't attract the stars. As fans of his movies, we enjoyed eyeing David Lynch enjoying his dinner at Figaro. The young lady accompanying him had hands that seemed busier under the table than they were with the knife and fork. Hope the rest of your weekend was just as enjoyable. Hmmm. "Biodynamic" is an actual agricultural term for a growing technique that indeed originated in France and was first brought to the US in the middle part of the twentieth century. However, the techniques were developed by small market growers around Paris in the nineteenth century. 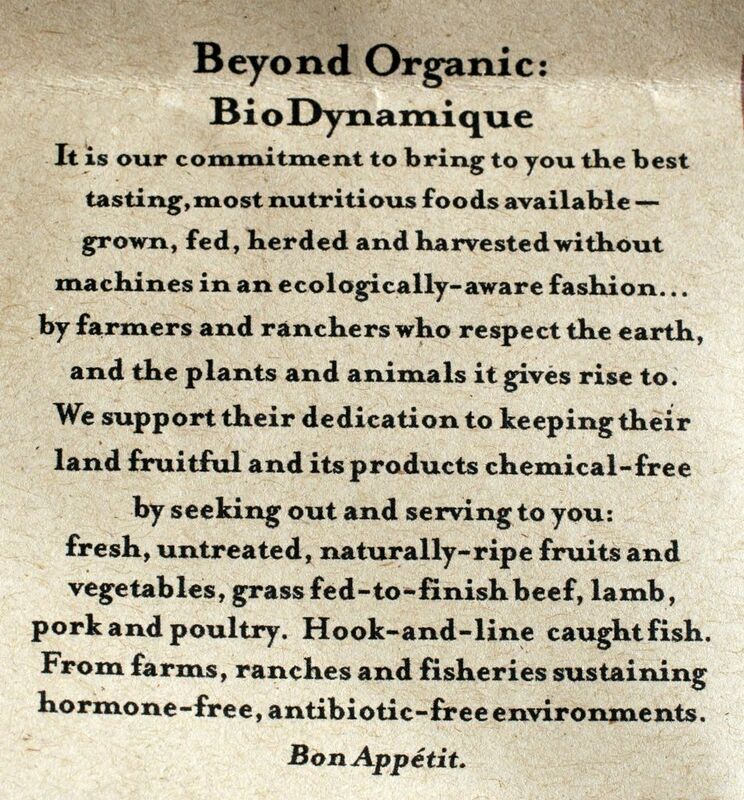 Interesting that the place would make much of thier "Biodynamique" status or philosophy, and then serve asparagus--sounds like jumping on a trendy bandwagon to me. As for the LA prices--I have a brother in law who lives there and he tells us that is just how prices are there. Out of sight. Great review, as always, Sam. Good on you for asking the hard questions, though! I just can't believe the prices! Unless they feed and kill the ox themselves? It's possible (possible, mind you not probable) that they're finding some local asparagus this time of year. The vegetables do not always fall neatly into seasons. For instance we get amazing local, organic strawberries until mid-late October. Farmgirl - it does sound like they are trying, in some way. But I am such a cynic. They seem a little precious to me. All their bakery goods are made with 'fresh spring water'. They have to justify their steep prices somehow. 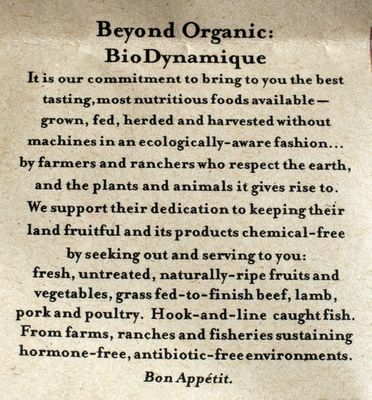 Barbara - I have read about biodynamic wine before, but not food, thanks for the extra details. haddock - I understand there *could* have been some rare local asparagus available - but in that case I would have expected someone to come to me with a viable and confident explanation. Monkey Gland - His haircut was scary enough without thinking about the under table activity. Errr.... maybe a mosquito had bitten her knee??? I love that restaurant, I had the most romantic and fun date of my life there. I am so sad to hear they got so pricy! Oh well, I know I will go back anyway, but maybe not so soon. oooh did he have the full on eraserhead? I reckon she was probably being biodynamic under the table. Sam, are you checking in with 10 Signs Like This? She links to a good story in the Guardian about local food sourcing at an English restaurant in Dorset. (Here). Scroll down to the asparagus part! I spent much time in some LA kitchens of restaurants that prided themselves on using local ingredients (featured by naming names on the menu, ie: 'Reagan Ranch Lamb Chops with Flockhart's Fava Beans and etc..etc..." then they would top desserts with some rock-hard blackberries from Chili (in December) that were bitter and acrid. In the fridge, there would be flats of Chilean raspberries and blueberries in the winter as well. I think some of it comes from people (especially in LA, chock-full of very important celebrities being used to getting-what-they-want-when-they-want-it)....I just know from spending time in LA kitchens they have to cater to big-shot clients more than in other cities... It's also the annoying "the customer is always right" mentality...people think it's glamorous to have asparagus any time they want it. Or blackberries. David - thank you for the insight. I wonder if they got the asparagus in especially for David Lynch? Waste of time, if so, he didn't seem much interested in the food. I hope all of the Eat Local efforts are causing people to think about seasonality too. I have a couple of friends who were dining with me that night, intelligent people, who just thought 'everything in CA is in season, all year round'!